The decision by the Government of India in May 2017 to commission ten nuclear power reactors of the type PHWR of 700 MW capacity, each in different parts of the country, and the proposal to add four more reactors of the type VVER of 1,000 MW capacity each at Kudankulam Nuclear Power Project (NPP), has given rise to many serious concerns to the communities around these projects, and to the concerned civil society groups in the country. If the massive opposition to the Kudankulam NPP in Tamil Nadu few years ago, the consequent social unrest in that area, and the opposition to the same by the civil society groups (CSO) from around the country are still fresh in memory, the decision by the government to commission more nuclear reactors may have initiated another wave of anti-nuclear movement across the country. While it has been made public that two of the ten PHWR type reactors are proposed at Kaiga NPP, in Uttara Kannada district of Karnataka state, the proposed location of the other eight PHWR reactors is not known at this stage. The societal level discussions on Kaiga NPP cannot become objective without considering the nature of the terrain around the Kaiga NPP. That terrain is made of undulating hills covered with thick forests as an important part of the Western Ghats (WGs) on the west coast of India. The forests around Kaiga NPP are considered to be some of the best tropical forests in the world with very high ecological value, rich tropical bio-diversity and many kinds of unique species (Report of the WGEEP, Ministry of Environment & Forests, Government of India, 2011). These forests are also considered to be among the main contributors to the World Heritage title to the WGs. They are also within one of the eight hottest of bio-diversity hotspots worldwide. The hill ranges of WGs, of which these forests are critical parts, are also considered as the backbone of the ecology and economy of south India, and are also considered as very good carbon sequestration systems in addition to being the water fountains of peninsular India. The Uttara Kannada district in Karnataka, where the Kaiga NPP project is located, is known to have some of the best tropical forest wealth, and is known as one of the best forest cover districts in the whole country. The forest cover in the district has come down from a high of about 70% of the land area in 1950s to about 40% now due to very many ‘development projects’ such as Konkan railway, Sea-Bird naval base, national highways, industries, many dam based hydel projects, and the Kaiga NPP since year 2000. As against the National Forest Policy (adopted in 1980s) target of 33% land cover by forests and trees, Karnataka’s forest & tree cover at present is less than 20% for which the forests of Uttara Kannada district are major contributors. Any further loss of such rich forests in WGs can spell doom not only to the drought prone state of Karnataka, but to the entire peninsular India, for which the WGs are considered as water fountains. 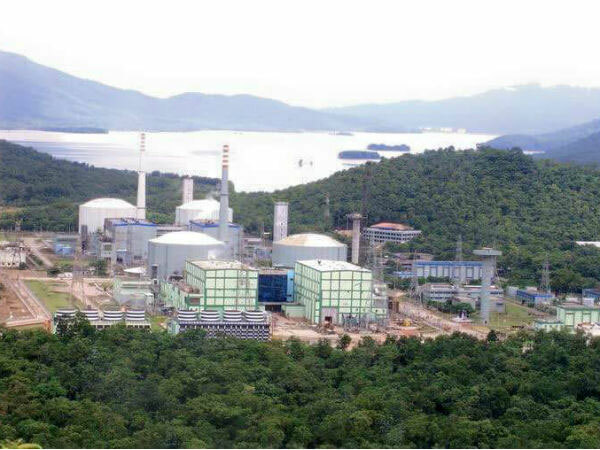 The increase in nuclear power capacity by 2.6 times at Kaiga NPP should also mean an additional fresh water demand on Kali river, which is flowing adjacent to the project, by a similar magnitude. If this also leads to an increase in the temperature of the discharged water from the project back to the river, it should be a matter of concern from the perspective of the creatures dependent on that river. Due to the increased volume of the used-water discharge from the project, the pollution level of the river water downstream of the project is likely to go up, despite the claims of project authorities on water purification processes to be deployed. It is a moot point as to what impact will this distorted quality of river will have on the concerned stakeholders. It is impossible to imagine that it will be beneficial from any perspective. The impact of the vastly increased radiation density (because of the 2.6 times increase in nuclear reactor activity) on the bio-diversity and the people working and living in the project area cannot be anything but negative. Additionally, the risk of any unfortunate nuclear accident can only multiply because of the need to store on site the vastly additional quantity of highly radioactive spent fuel for hundreds of years (India has no policy as yet to store the spent nuclear fuel and other associated wastes away from the nuclear reactor site). While the levelised cost of solar and wind energy have fallen beyond all expectations since 2010, and are projected to continue to fall further (as at the end of May 2017), the cost of nuclear energy has been continuously increasing and can only go up further in order to incorporate additional safety features, which are becoming mandatory subsequent to Fukushima nuclear disaster. Although the cost of electricity from the proposed 700 MW type PHWR reactors may not be known yet (this type and size of nuclear reactors are not in operation as of now), it may not be unrealistic to project it to be not below Rs 5.00 per kWH, when we consider the cost projected for the massive Jaitapur NPP. Due to many hidden costs, subsidies, and the type of tariff determination model deployed in the case of nuclear power in India (where, as per some reports, the cost of capital finance during the construction is not fully accounted for), the true cost to the society of nuclear power can be said to be much more than that is published. In contrast, through international bidding process the solar power has already been contracted below Rs. 2.5 kWH per unit for 25 years, and the wind power below Rs. 3.00 per kWH. The electricity from nuclear power reactor was considered suitable to a rich society with high per capita electricity consumption because of these reasons and also due to its base load nature. In the case of India, which is experiencing more of a continuous increase in peak hour power demand than on the annual energy front, it will be hard to find nuclear power economical to the poor population. Now that even rich societies have decided to move away from nuclear power to renewable power sources because of cost and nuclear accident considerations, the question that needs to be addressed is whether there are any substantial local reasons for a resource-constrained society like India to continue to pursue this costly and risky power source. As per a news article in “Wall Street Journal” May 12, 2017, there are about 450 nuclear power plants worldwide, more than half of which are nearing the end of their planned lives. The massive task of dismantling them will require years of risky work and tens of billions of dollars. It is estimated that dismantling just one of them may cost up to $1.5 billion. This eventuality also brings in to question whether the projected cost of such dismantling and safe storage of the nuclear wastes associated with the large number of nuclear reactors planned for the country have been objectively included in the overall cost of the plant while determining the price of its electricity in India. Whereas the Chernobyl accident in 1975 was a grim reminder of the reality of the dangers associated with nuclear power, the Fukushima accident in 2011 shook the world from its stupor. Since then many countries (Germany, Japan, Italy, and Switzerland) have announced the plans to move away from nuclear power. France, US and South Korea have announced plans to drastically cut the share of nuclear power. The credible risk perception of any unfortunate nuclear accident should be a matter of great concern to any community close to a nuclear power project. A cursory look at the social and environmental impacts of two nuclear reactor disasters in human history at Chernobyl and Fukushima should be enough to indicate the grave risk facing the communities around Kaiga NPP (and of course the other nuclear power projects in the country). It is reported that due to the nuclear accident an area of about 650,000 acres around Chernobyl has become unfit for human habitation even after a lapse of 30 years. It will be a horror even to imagine the consequences of an unfortunate nuclear accident on a densely populated country like India, which is already facing serious issues of land availability. Addition of two nuclear reactors at Kaiga NPP will only increase the probability of such an accident, the consequent cost of which can never be calculated and recovered. Since the communities around Kaiga NPP are distributed over a large forested and hilly area, the evacuation of every one of them in case of a nuclear emergency will be very difficult. A diligent study of this scenario by the National Disaster Management Authority may throw up many challenges. This may be true in many other existing or planned project locations too in India. The leaders of Russia and Japan, who were at the helm of affairs at the time of nuclear disasters at Chernobyl and Fukushima, have expressed similar concerns about the safety of nuclear power technology and have also cautioned the global communities to be extra careful before investing in nuclear power technology. As a welfare oriented society with dense population, India cannot afford not to take cognizance of such concerns by a former Chairman, AERB, and many other civil society leaders. We cannot expect the civil society either to be rest assured until all the concerns raised by such experts are addressed satisfactorily before we consider building more nuclear reactors.